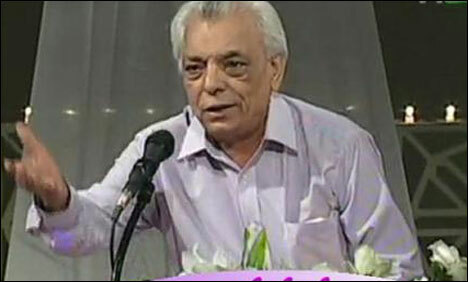 Pakistan veteran lyricist, journalist and poet Riaz-ur-Rehman Sagar was laid to rest in Lahore on Sunday. 72-year-old Riazur Rehman died on Saturday night. He had been undergoing cancer treatment at a private hospital in Lahore. His funeral prayers were offered in Commerce College grounds on Sunday afternoon. He composed more than 2000 songs in his life, mostly for the Pakistani film industry. His songs were often pivotal in musical films like Sargam, Intiha, Muhabbatan Sachian and Ghongat. Saghar also wrote many pop songs such as Hadiqa Kiani’s ‘Dupatta Mera Malmal Da’ and ‘Yaad Sajan Di Ayi’. His recent works include the lyrics for ‘Main Tenu Samjhawan Ki’, featured in the Punjabi movie ‘Virsa’. Rahat Ali Khan, Adnan Sami, Waris Baig, Sheeraz Uppal and Freeha Pervez have earned great fame by singing his songs. He also laid the foundations of poetic column writing in Pakistan. His published works include ‘Aangan Aangan Taaray’, ‘Arz Kiya Hai’, ‘Who Bhi Kya Din Thay’ and ‘Chand Jharokay Mai’. President Asif Ali Zardari‚ Information Minister Arif Nizami and Pakistan Muslim League-Nawaz (PML-N) Chief Nawaz Sharif expressed their sorrow over his death.